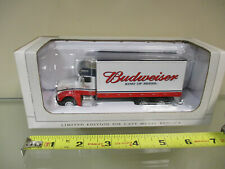 This item is a new -in-box and un opened SpecCast 1:64 scale diecast Peterbilt 387 tractor trailer with opening rear trailer door. Painted black with colorful decals of 6 tractors and CASE IH logos. (DCP) #32754. 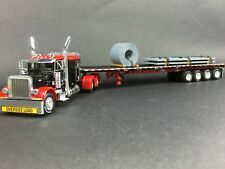 Peterbilt 379 Tri-Axle w/Fontaine Lowboy, Jeep Dolly, Stinger, & Wire Reel Load. 1 of only 252 Worldwide! This model will make a perfect addition to your collection! Here is your chance to pick it up. Perfect for that car fanatic in your family. 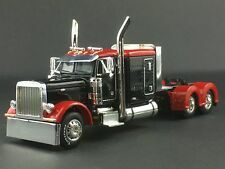 Mark's Toy Box Exclusive: Black PETERBILT 385 WRECKER TOW Truck. 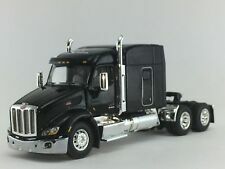 Diecast Promotions 1:64 Peterbilt 379 Sleeper Cab with Fontaine Magnitude Lowbed Boat Trailer - Brand New! 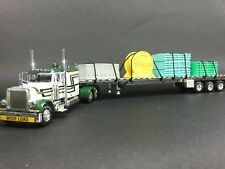 - Item # 32604 - Series II Diecast cab & trailer - BRAND NEW in original box - "J.J. Keller & Associates" branding - USPS shipping with tracking - Will ship within 24 hours of payment recieved - Trusted Ebay seller for 20 years with 100% Positive Feedback Rating - Please ask any and all questions before bidding. I will respond ASAP -Thanks for looking! 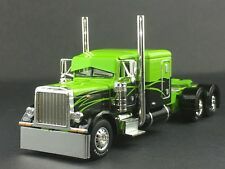 Authentic Peterbilt 351 design. Competitive Pricing and Unrivaled Selection We are the number one direct distributor of diecast model cars in the USA, so we are able to provide very competitive pricing. (DCP) #34147. Yellow Peterbilt 579 Tri-Axle w/Fontain Lowboy Trailer, Jeep & Stinger. What a Super Collectible Vehicle for Display! This Peterbilt Gleaner Truck and Trailer would make an Excellent Addition to any Diecast Semi Collection and is a Must-Have for the Serious Fan/Collector! 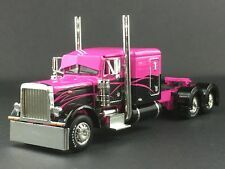 13"L x 2-5/8"W x 3-5/8"H, A nicely painted and detailed truck, see complete details below. • Series: Fallen Flag Series #25. • Pivoting fifth wheel. • First Gear: Model No. : 60-0491. • Collectors box approx. (DCP) #30621. "Kwik Kargo". Peterbilt 379 w/Utility Refrigerated Trailer. 11" long and very rare aerodynamic Peterbilt 372 COE (last Pete cab-over produced). Highly detailed model in the orange and black HD colors. Key is attached to bottom of trailer and opens back doors of trailer. (DCP) #33567. Peterbilt 379 Sleeper Cab w/Fontaine Tri-Axle Lowboy. SPECCAST PETERBILT 385 STAKEBED. BED SIZE: 3.25"L x 1.75"W.
(DCP) #34146. Peterbilt 579 44" Sleeper Cab Tri-Axle w/Fontaine Magnitude Lowboy, Jeep Dolly, & Stinger. (DCP) #30739. Peterbilt 379 w/7-Axle Flatbed Trailer. Mark's Toy Box Exclusive: BWF PETERBILT 385 WRECKER TOW Truck. 1 of only 252 Worldwide! This model will make a perfect addition to your collection! Here is your chance to pick it up. Perfect for that car fanatic in your family. Trucks, semis, farm toys and much much more! (DCP) #34081. Peterbilt 579 w/Utility Dry Freight Trailer. "Western Distributing". "Altom Transport". (DCP) #30602. Peterbilt 379 w/Heil Fuel Tank Trailer. Item is New in Box. NEPOTE RANCHES. DCP #30415. Peterbilt 379 with Covered Wagon Trailer. STUNNING Truck.